Should this post be edited (or replaced) with a link pointing to the 8, or soon, 9 user guide instead of the 7 one? I'm running "Gloria" from an 8GB bootable USB drive with a persistent installation. I used the Unetbootin tool to create the installation, then added a casper-rw file and modified the .config file so that the default boot instruction is marked as persistent. The OS boots into all of its Mint-y fresh glory, and all is well. Drivers can be modified, background can be changed, etc., and life is good. Until I try to update. I connect seamlessly to the Internet, download goes smoothly...until I run out of space! Now, I double checked by mounting the drive in Win7 and it shows about 6+GB of free space. What gives? Is this because I downloaded and used a 512MB casper-rw file? Any sage words of wisdom would help here. My intent is to create a handy, portal, persistent OS-on-Flash, so I need to be able to update/modify applications and drivers. I have a question whose answer i could not found. I have a 4 partitioned laptop (1 for linux, 1 for swapp, 1 for windows and 1 for data) I want to instal Isadora using the dis as it is. That means that i want to put the system in 1 partition and the data (/home?) in the other one (150g), maintaining the swapp and the windows ones. Also i would like that the data particion could also be accessed by windows. How can i manage to do so? If this question is answered, please tell me where. Not really sure where to post my story, but this topic seems to be related. First want to tell you that I travel a lot to Africa and I am taking my laptop (actually owned by my employer) with me all the time. This laptop is about 4 yrs old now and so is the disk inside (80GB - 2 equal partitions, one running WinXP + SW, the other for data - and very important : the whole disk is encrypted with Poinsec SW). During some of my journeys in Africa one of my colleagues crashed their HD's on their laptops, and had lots of trouble there to have their laptops running again. So I bought a 2.5" 500GB USB disk, installed Linux Mint 8 (after having tried some other distributions first) on it as kind of a disaster recovery precaution, together with a copy of my data. This went quite well and I configured the setup of my pc so that it would boot from usb drive, before trying the internal drive. So if the external drive was plugged in when booting, the pc started up from the installed Linux Mint. When version 9 was released I took the first chance I had to upgrade my usb drive. Then things went wrong : for some reason the installation wasn't limited to my external drive (my internal drive wasn't touched when I installed Mint 8 though!? ), but also my internal drive was somehow impacted by this new installation of Mint 9. Probably only the MBR was affected, but due to the encryption of my disk, the pc was no longer able to startup the necessary decryption SW and therefore couldn't find the installed WinXP anymore (which I still need for my job). - did I do anything wrong ? I guess that next time I better unplug the internal HDD before I start installing. Or is there another solution ? - we (IT dept and myself) tried to repair the damaged disk, but without success. At the end the company image file was restored and I could recover my data from a recent backup file. Did we overlook another solution ? Any suggestions ? - a last question which doesn't really belong here, but which is linked to my disaster recovery plan that I explained before : I'm still looking for a way to read the copied PST-files (as we are using Outlook 2003 in the office) with a linux application. This would complete my disaster recovery plan. Today this part is still missing. Is there a way to read those PST files ? or to convert them into a format readable by Thunderbird or a similar program ? Thx in advance for any attention and any of your thoughts. mpre wrote: I have a question whose answer i could not found. I have a 4 partitioned laptop (1 for linux, 1 for swapp, 1 for windows and 1 for data) I want to instal Isadora using the dis as it is. That means that i want to put the system in 1 partition and the data (/home?) in the other one (150g), maintaining the swapp and the windows ones. Also i would like that the data particion could also be accessed by windows. How can i manage to do so? During the installation process, make sure you select the "Specify partitions manually (advanced)" option when it is time to partition your drive, and ensure that your current Linux partition is marked as "/" and that you make sure that the format checkbox beside it is checked. You do not have to do anything with your existing swap partition, since it should automatically be recognized by Mint. As for the data partition, it completely depends on what filesystem that partition is formatted in. If you're using that partition for /home, I'd personally stick with a Linux filesystem, e.g. ext2/3/4, but the problem is that Windows does not recognize any Linux filesystems by default (afaik, it only recognizes NTFS and the old FAT filesystems). Here are some possible solutions for that: http://www.howtoforge.com/access-linux- ... om-windows. On the other hand, you could just format it as NTFS, which both Windows and Mint recognizes, but since full featured access to NTFS in Linux is sort of an ongoing project, you may encounter issues...I haven't tried this before, so I don't know to be honest. What I prefer is to put all Linux partitions (/, /boot, /home, /swap) I have into an extended partition, and the Windows partitions in separate primary partitions. Are you sure you don't have any other partitions though? Maybe some manufacturer recovery partitions? You always have to consider them when setting up your partitions correctly. Also, do make sure you make a full backup of your system before starting the partitioning and installation process. The chances that things could go wrong are slim, but still existant. TacBeaver wrote: Then things went wrong : for some reason the installation wasn't limited to my external drive (my internal drive wasn't touched when I installed Mint 8 though!? ), but also my internal drive was somehow impacted by this new installation of Mint 9. Probably only the MBR was affected, but due to the encryption of my disk, the pc was no longer able to startup the necessary decryption SW and therefore couldn't find the installed WinXP anymore (which I still need for my job). Well, since you've already restored a disk image, everything should be fine now...but make sure that in the future, you unplug all external devices and drives as a precautionary measure before installing Linux. You say the MBR was affected; I'm assuming that Mint installed Grub into the MBR of your internal drive, not your external one? That sometimes happens, unfortunately, if you skipped a very important step in the last step of the Ubiquity installer. Just above the "Install" button is an "Advanced..." button; clicking that will let you configure two things: 1) where Grub is installed (or whether or not it's installed), and 2) proxies. I'm guessing that you left the options at their default values, or forgot completely about them, heh. By default, Grub installs itself to /dev/sda, so if /dev/sda refers to your internal drive, that's what caused the problem. TacBeaver wrote: a last question which doesn't really belong here, but which is linked to my disaster recovery plan that I explained before : I'm still looking for a way to read the copied PST-files (as we are using Outlook 2003 in the office) with a linux application. This would complete my disaster recovery plan. Today this part is still missing. Is there a way to read those PST files ? or to convert them into a format readable by Thunderbird or a similar program ? Thanks for your reply. Indeed, being still quite new and inexperienced in using any Linux stuff, I usually stay away from the "advanced options" . When I tried to startup from the original XP partition, there was indeed an error message about grub not finding an OS (can't remember the exact message). So those advanced options let me choose whether or not to install Grub ? That would indeed have prevented my problems, I guess. Thx for your advise. I'm beginning to see why Mint is showing off with it's community . Yeah, there's an advanced option that lets you do that, although personally, I don't understand why the Ubiquity installer tries to hide the location of the Grub install on the very last step, hidden under the guise of an "Advanced" button. Most other Linux installers I've seen do a better job at telling you straight up exactly where Grub is going to be installed to and let's you change the option easily if need be. Anyways, I'm not too sure whether or not I've explained this clearly enough, I've grabbed an image off of the Internet (probably a screenie of an Ubuntu Hardy installation). See where the "Advanced..." button is, to the right of the mouse? Clicking it will open a small window similar to this...except this image is probably quite old. I don't have my live CD with me at the moment, so I can't take screenies of Ubiquity myself. Grabbing images off of Google's image search will have to suffice. 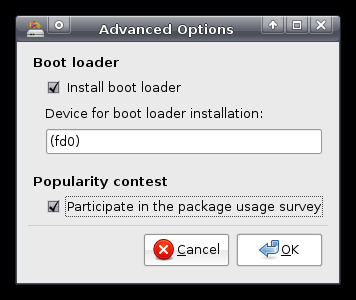 The textbox where it says (fd0) has been replaced by a drop-down menu that lets you choose either the MBR (/dev/sdx) or a specific partition (/dev/sdx#) to install Grub to. The package usage survey option isn't there anymore (I told you it's an old image ). Anyways, don't be afraid to check out advanced options from time to time...you might occasionally find stuff that's actually useful for your purposes. OK, thx again for your extensive answer. I'll certainly pay attention to that for my next installation. But I'll remove (physically) my internal HDD too to be on the safe side anyway. It took me a couple of days before I had everything running again when they re-installed my pc from scratch. I had posted this on Sunday but got no replies so perhaps it was in the wrong place - I'll try for a response here. I began using Mint 9 shortly after the RC was announced and have updated almost daily. Should I reinstall the final release or is the fully updated RC now a match the final release? There are only a couple of things that do not work properly. One is the "suspend" and "hibernate" functions on my HP dv2 which I realize could be a hardware problem. Both functions go to sleep - either with the function key or as programmed in power options - but just do not wake when asked and I do like using suspend for short downtimes. Otherwise it is the best Linux I've seen and I have been toying with Linux since way back in the dark ages - when Mandrake and a few more were first available. About six weeks ago, about the time the RC was announced, I accidentally deleted my Vista drive and the idea surfaced, why not? I had already installed Mint as a dual boot, liked what I saw, and so erased the whole drive and started from scratch. It is now the only system on this machine and I am as happy as the proverbial clam. Of course I have a lot the 4G of ram not being used and the 320G drive is almost vacant - any ideas as to what I can use it for. . . just kidding. Incidentally, the two Window apps I had always thought I could not live without, Lotus Organizer and Quicken, are now running in V-box. Mail is all done on Google and so, it's a wonderful world. After all these years. Sorry, afraid I got off the subject - about updating the RC. Is it good to go or should I download the final release and reinstall? A fully updated RC will be the same as the final release, so you can just run mintUpdate, install all the updates offered, and you'll have the same base system as others who have clean installed Mint 9. Thank you Vincent. I Thought as much but didn't know if there might be some additional programs/tools in the final. Since you are responding i have one problem you may be able to help with or tell me where to go for help. Perhaps I should start a new topic? I have tried a search on the subject without results. The Suspend and Hibernate functions do not work. I am using an HP dv2 (Thin and Light) and everything seems to work fine except it will not awake when asked. It goes into Suspend using the function key and Hibernate if I choose that power option. Just does not respond except with the power button. I wonder if it is an HP thing? Please start a new thread about that. Suspend issues can be very complex since a lot of hardware and software is involved in the process of suspending and resuming. In your new thread, please provide a few things for starters: the output of "inxi -F" in a terminal, the contents of "/var/log/pm-suspend.log" (in a terminal: "gedit /var/log/pm-suspend.log", or use the Log file viewer to open it), and also, any suspicious dmesg messages you can see (or just attach the entire dmesg output into a separately attached text file). Also, can you precisely describe what your laptop physically looks like as it goes through the process of suspending and resuming? E.g. Does anything show up on the screen/is it just blank? Is your system still responding (press CAPS Lock to test; if CAPS lock can be switched on and off, your laptop partially resumed successfully, otherwise the entire system is likely frozen. Try pressing CTRL + ALT + F1 to see if you can get to a terminal (if you can, try restarting gdm, and take note of any of dmesg's output on your screen). I don't know if its the right place to post this. Im a Linux Mint newbie. Last week I decided to assemble a new PC for my wife. She's an avid Windows user and I wanted try Linux, so what I did was to dual boot. I installed the 2 OS on separate hdds. XP on the master hdd and mint on the slave. When I was installing Mint on the 2nd hdd, a prompt appear on where to write the boot loader, when I selected the first drive, an error occurred which says Can't write on bla bla.. So what i did was to set the 2nd hdd with Mint as the master and the XP one as slave. Can you please help me what caused that? Everything you imagine in life is possible. If you ask a question which is already covered in the guide you will simply be recommended to download the guide, so you are speeding up the process if you just read it in the first place. Although if something in the guide fails to make sense to you or you want more explanation then don't hesitate to ask it here on the forums, we will do our best to help you. Welcome to the Linux Mint Community. Thanks for taking the time to make that! Very useful! TacBeaver wrote: OK, thx again for your extensive answer. I'll certainly pay attention to that for my next installation. But I'll remove (physically) my internal HDD too to be on the safe side anyway. It took me a couple of days before I had everything running again when they re-installed my pc from scratch. I just noticed this reply, and wanted to reinforce that, if you aren't familiar with the Mint/Ubuntu installer (or even if you think you are), removing the internal HDD before doing a test install to some other device (such as an SDHC memory card or USB flash drive, if the machine will boot from one of these) is prudent disaster insurance. This has been my practice for most of the past year, since installing Ubuntu 9.04. A few months ago, I decided to give Ubuntu 9.10 a try. I got lazy/over confident, and left my HDD in place while installing to an 8gb SDHC card. Even though I was installing to an SDHC, the installer modified grub on my HDD, as part of the switch from grub legacy to grub 2, and when I rebooted, neither the SDHC nor the HDD would start the machine. I later learned that there was a fairly simple fix for this, but not until after I had restored XP, spent a day downloading MS updates, and re-installed Ubuntu (9.04). I'm now running Isadora on the SDHC and Lucid on the internal drive, and both are very stable. When I came to boot it, I came to the memtest86 screen instead of the boot options screen. I used the live flash drive to check the files from the installation were present on the 160 GB hard disk which they were. I am really stumped and I don't know which words to use to search for the solution, so help would be appreciated. Last edited by Oscar799 on Tue Jul 27, 2010 2:43 am, edited 1 time in total. Reason: Spam links in signature.Post seemed sensible so I removed the link.See what happens next. The Main (Gnome) edition of Linux Mint calls for a minimum of 512 MB of RAM. You may have better luck getting Mint to run if you use a more lightweight version, e.g. Mint Xfce, LXDE, or Fluxbox.